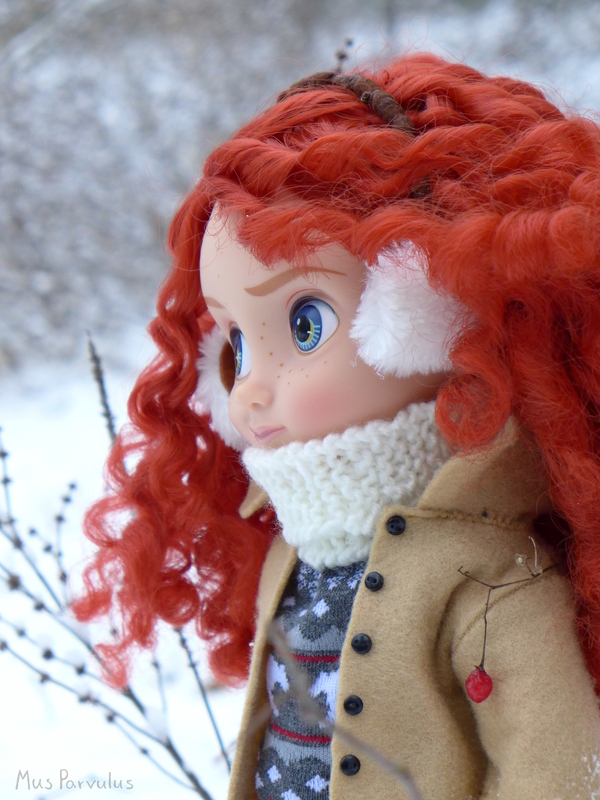 When I first watched Frozen in a cinema in 2013, I liked it a lot. I love winter, so the theme and all the beautiful views were a treat, and also I appreciated the wisdom that film conveyed. And then… the waves of endless Frozen merchandise hit the stores everywhere, and everything seemed a little less special than before. It looks like a story book! 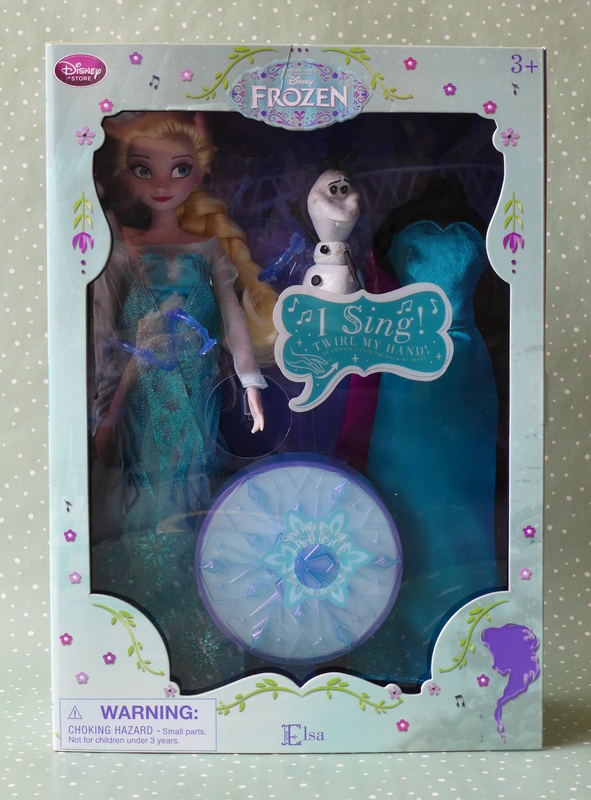 Of course, the contents do not disappoint either: Elsa comes with numerous accessories, a spare dress, and even a little companion in the snow-person of Olaf. There have been quite a few Elsa’s since her original release – after all, every little girl wanted one 🙂 They don’t differ that much, but one significant detail that has changed over time is the shape of her bodice. The movie accurate, heart-shaped bodice is the less frequent, and I must say I like it more. As you can see, this version does have it (the alternative has a simple, straight edge at the top of the opaque part). This time around, there is no glitter other than on the cape. I like it this way as well. It’s overall very well made, only slightly crumpled from being pinned shut inside of the cape while in the box. Elsa’s face has been mostly the same until very lately, and with good reason: it is pretty and accurate. Mine has a slightly chipped lip paint, but no big deal. 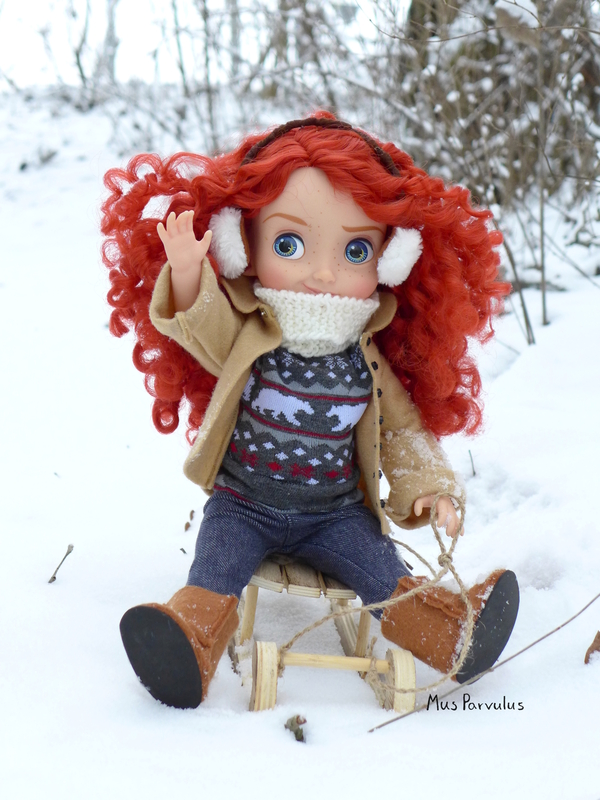 As far as her hair is concerned, I appreciate that they tried to faithfully recreate her wind-blown braid, but I wish it was a little more… wind blown. You can see various carefully styled strands from the back, but the front looks a little too helmet-solid. Also, what’s up with these… earlocks? Looking from the back, you can also see the battery compartment and the speaker. 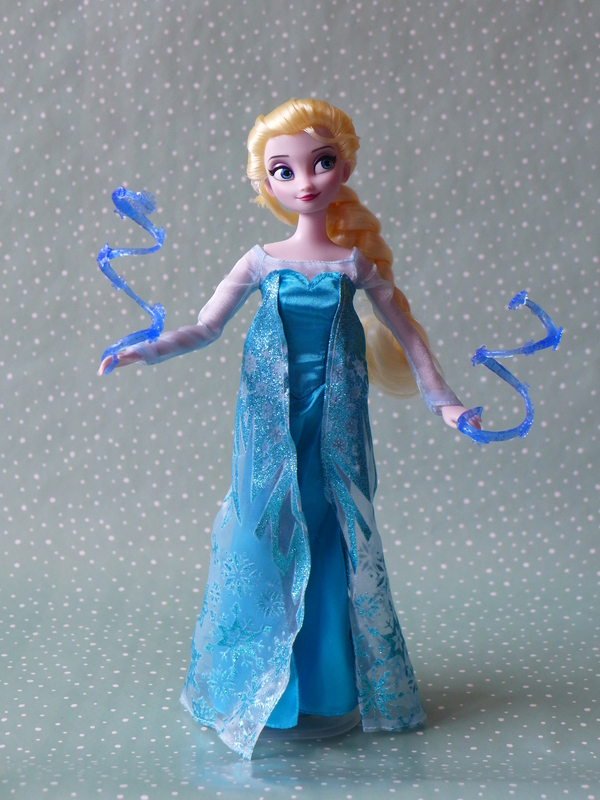 Elsa comes with a plastic representation of her ice-powers. 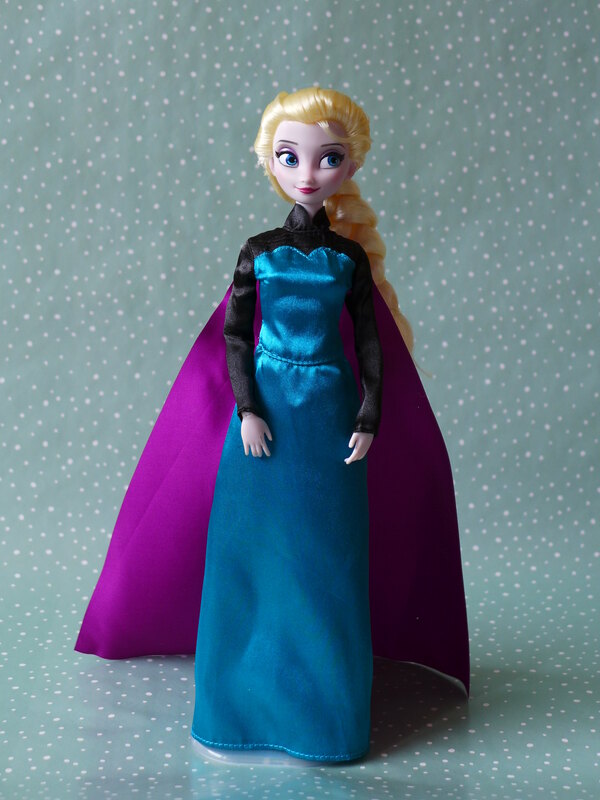 This is pretty cool, and will certainly help recreate the “Let It Go” scene – which the set is all about. When you move her left wrist to the sides, she plays a fragment of the song, exactly as in the film – starting from the line “It’s time to see what I can do…” up to “…you’ll never see me cry”. The wrist can be moved up and down without starting the music. However, the left arm lacks elbow articulation, as it apparently hides a part of the mechanism. On her hip, there is an on/off switch. When you press the button in the center, it flashes different colours for a couple of seconds. It is a pretty thing, but kind of pointless. It should have been the base of a stand for the doll. Perhaps I should try make into one? I was very excited for Elsa’s coronation dress – all of the dresses in “Frozen” are lovely, so the more the better! Although it does not have any the intricate details it had in the film, it still looks great. The cape is detachable. Unfortunately, it has been pierced by all the plastic tabs from the packaging and there are little holes in it. The feet are made to fit high heeled shoes as well. The legs are rubbery, with an internal knee joint that allows a modest degree of movement. Let’s not forget about Olaf. 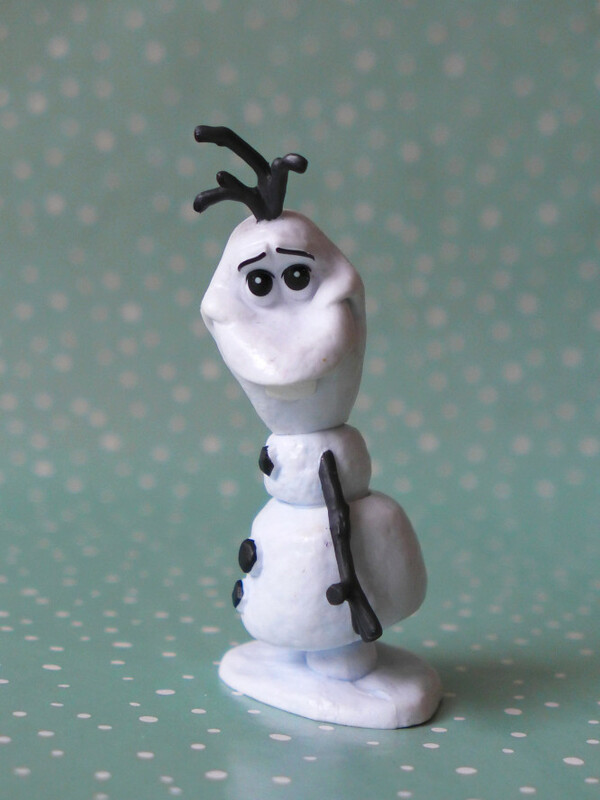 Now, don’t hate me for saying that, but I don’t particularly like (or particularly dislike) Olaf as a character. But he is a part of the story, and and it is nice to have him in the collection. The figure is well made and faithful to the film – even though not articulated in any way. He does not have his nose, because he too is based on the “Let It Go” moment in the story – where Elsa re-creates him, without the carrot nose. 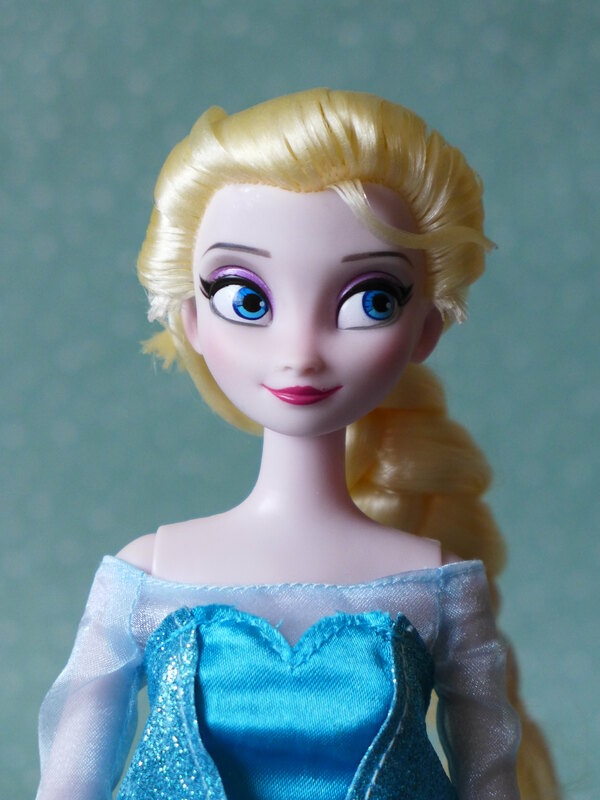 Elsa is an iconic character from a pretty great animated film, and this doll represents the character very well – Disney Store sure knows how to turn their princesses into dolls. 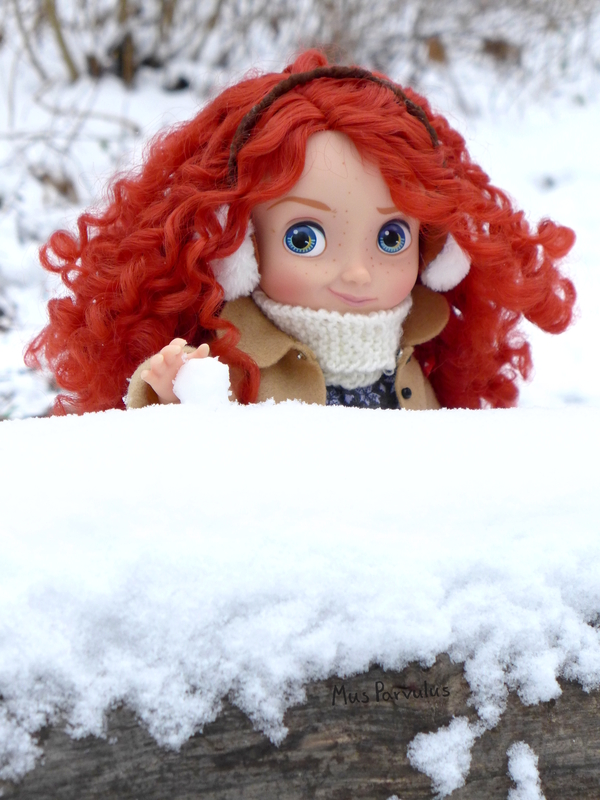 I also wanted her in my collection because of my love for winter and snow – it’s not often that we get a heroine inspired by such themes. 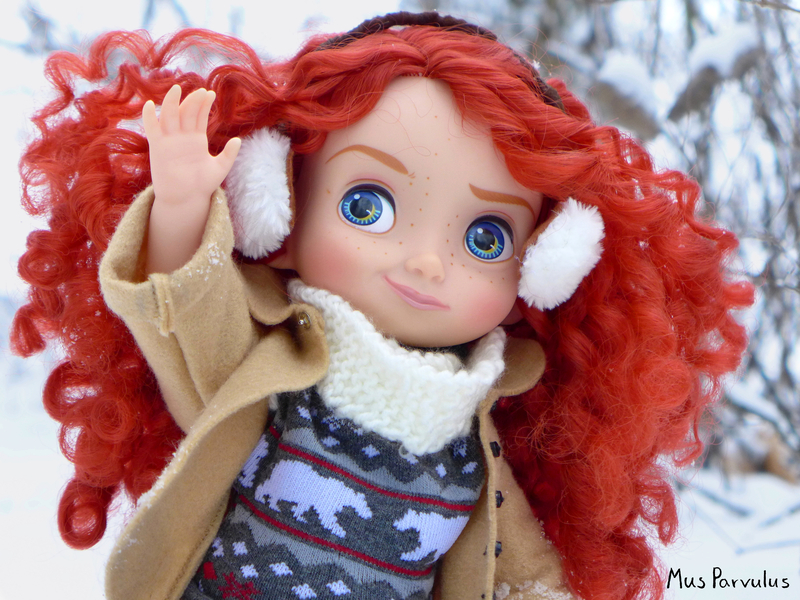 I am excited for the prospect of taking this doll and creating something new with her and for her 🙂 Elsa may be loved by many, very many, but I hope I can add a personal touch to her doll. I made the boots according to the awesome free pattern from https://iivenihmetykset.blogspot.com/2012/11/uggit-nelli-tahkapaalle.html (many thanks to the author for publishing it! ), except I sewed the pieces in such a way that the seam allowance faces outwards. I think it makes them even more Ugg-like. The ‘sweater’ is more of a sweater vest, and it was made from a sock. A sloppy, trial-and-error sewing job. 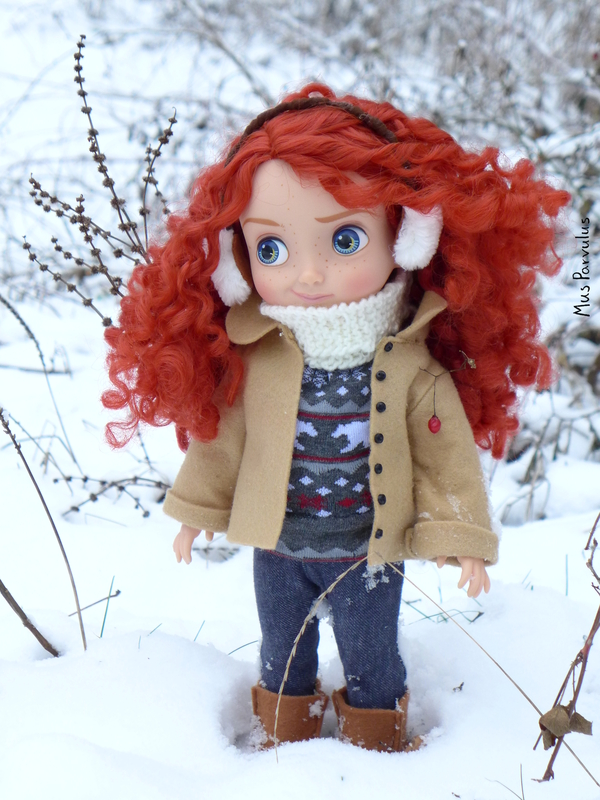 I made the earmuffs similar to how MyFroggyStuff made hers, except I didn’t use pom poms. I used a circle of fluffy fabric and gathered it around the edges. The rest of the clothes was recused from previous projects. I was quite lucky to find the little sled in a home decor section. It is perhaps slightly on the small side, but not by much. Luckily, decorative sleds in different sizes seems to be popular these days. The furry seat was already there. I only added the rope to pull the sled. 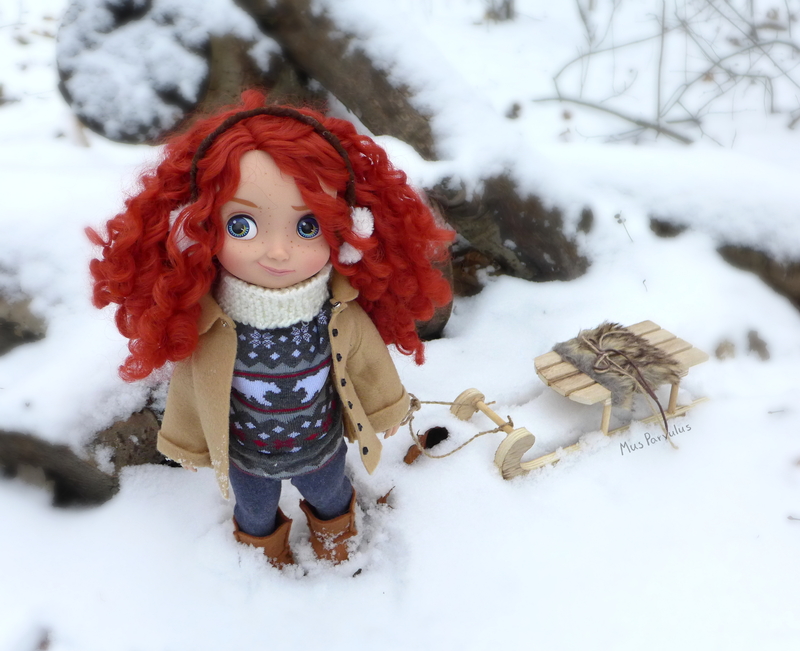 This is my first post about an Animators’ doll in quite a long time. These dolls were the reason I decided to take up doll collecting again in adulthood, but at a certain moment did not inspire me the way they used to. Sometimes I’ve felt bad about it but, in the end, dolls supposed to be fun, you can’t force yourself to enjoy something. I believe you just have to let the excitement return to you naturally when it wants to.